At the top of the Plate, on the left, a Bust of a Woman. 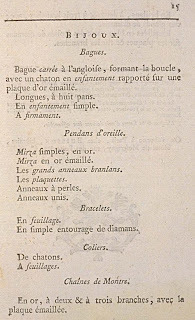 Kerchief of Italian gauze, à la Henri IV, knotted with a pink ribbon. Gown of dark green satin. On the right, another Bust of a Woman. 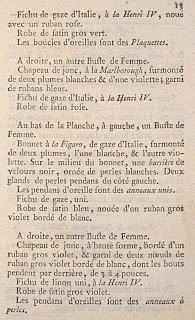 Cane hat, à la Marlborough, surmounted by two white plumes and a violet one; trimmed with blue ribbons. Kerchief of Italian gauze, à la Henri IV. At the bottom of the Plate, on the left, a Bust of a Woman. 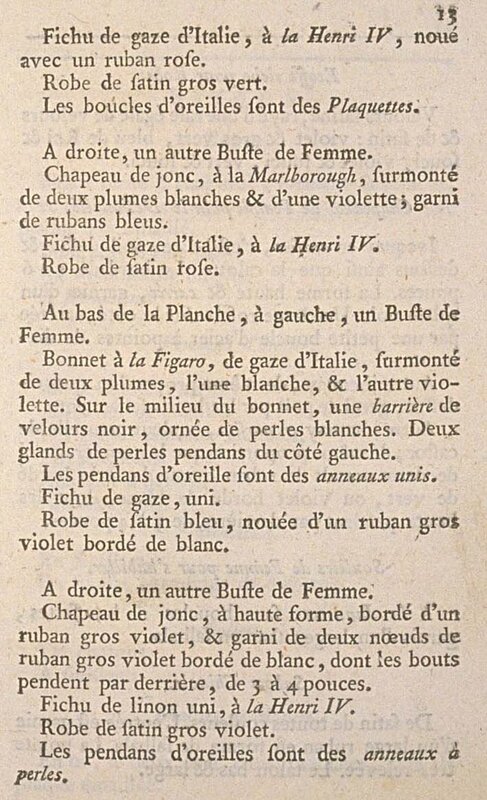 Cap à la Figaro, of Italian gauze, surmounted by two plumes, one white, and the other violet. In the middle of the cap, a barrière of black velvet, trimmed with white pearls. Two pearl tassels hanging on the left side. The earrings are plain hoops. Gown of blue satin, tied with a dark violet ribbon edged with white. Cane hat, with a high crown, edged with a dark violet ribbon, and trimmed with two bows of dark violet ribbon edged with white, whose ends hang in the back for 3 to 4 inches. 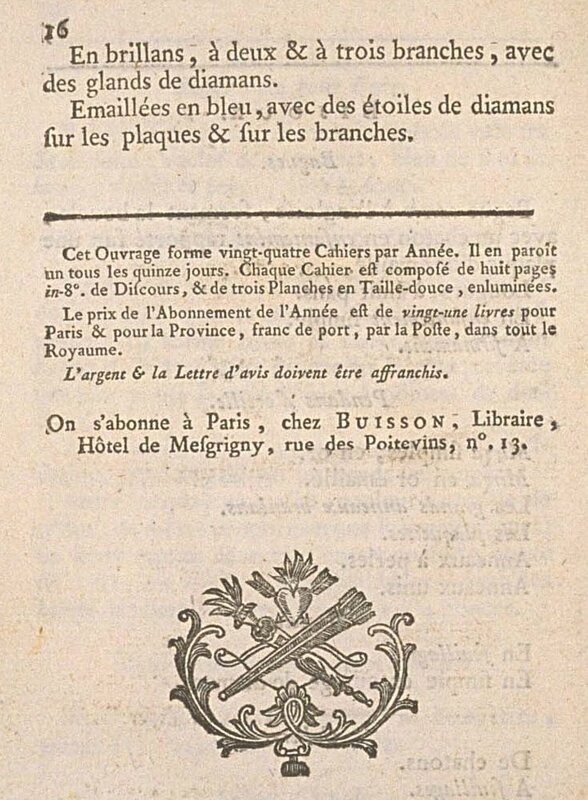 Kerchief of plain linen, à la Henri IV. Gown of dark violet satin. The earrings are hoops with pearls. Satined velvet, striped with equal stripes of velvet and satin; violet and dark green, Royal blue and marigold, violet and marigold, green and marigold. Jocquay en ourson, that is to say, nap on top and beneath together with the skullcap. The brim is 5 to 6 inches wide. The crown high and squared, trimmed with a black ribbon. A large bow on the side, held by a little steel buckle with diamond points. Another jocquay, of the same size as the previous, trimmed with nap only on the brim. Another jocquay en ourson, in the natural color of the beaver; of the same size as the first, trimmed with two bows of canary's tail ribbon edged with green, or violet edged in which, whose ends hang in the back for 3 to 4 inches. 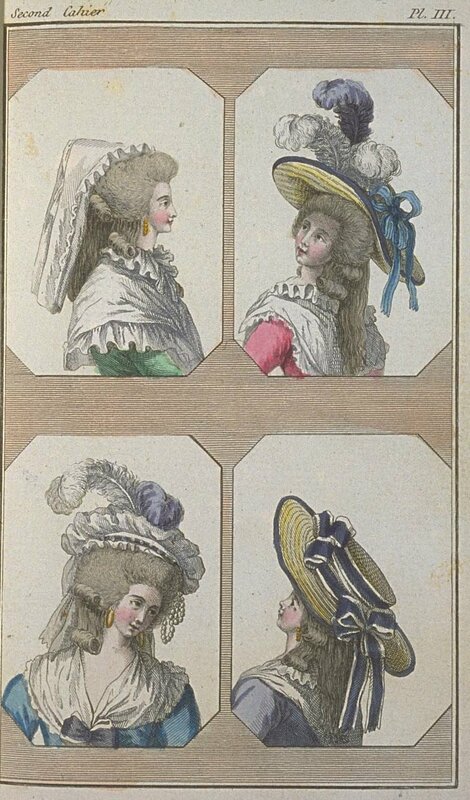 A la Jannette,* without buckles or bouffettes,** trimmed with a wide ribbon as a flounce. Of satin in all colors. 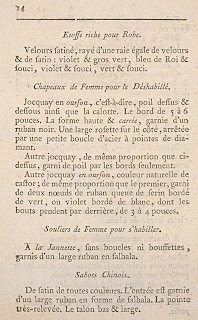 The opening is trimmed with a wide ribbon in the form of a flounce. The toe is very turned up. The heel low and wide. Squared ring à l'Anglaise, forming the buckle, with a stone en enfantement† held on a plaque of enamelled gold. In a simple circle of diamonds. In gold, with two pr three branches, with the plaque enameled. 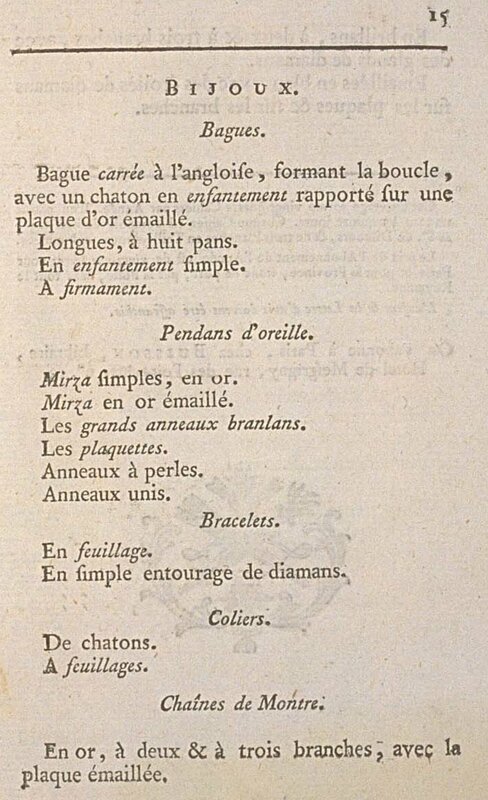 In brilliants, with two or three branches, with diamond tassels. Enameled in blue, with diamond stars on the plaques and on the branches. 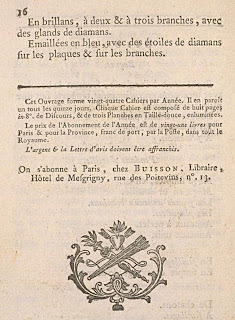 * Jannette, ou Les battus ne paient pas toujours l'amende (Jannette, or the Beaten Do Not Always Pay the Fine) seems to have been published around 1781 and reprinted throughout the decade. 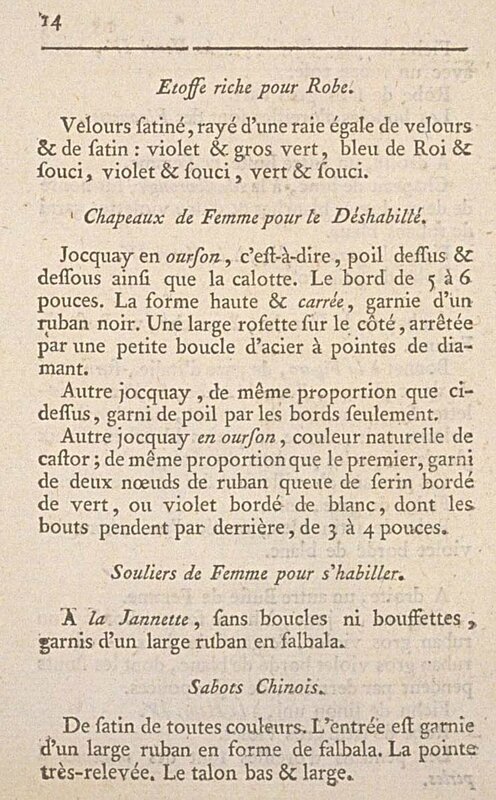 The titular Jannette was the simple but sweet servant of a Mme Duhazard, a retailer of "friperie". Loving the detail and the notations. Another set of treasures, revealed. Oh, sweet Internet, Pandora's box open'd!